These beignets are definitely not traditional. Not only are they baked, but they are infused with amazing saffron flavor! Delicious Saffron Baked Beingets are perfect for any breakfast or brunch. I HAVE made gumbo and jambalaya and eaten Bananas Foster. That’s about it. I did A LOT of research about these babies. A LOT! Since I’ve never had one, I wanted to make sure I got them right. Oh yeah. NAILED IT! At least flavor-wise. These beauties are golden delicious goodness in an easy to make dough made healthier by baking them instead of frying them. But, I didn’t want them to be all plain beignets. I wanted to “kick it up a notch” so to speak. I’m not sure how I stumbled on it, but someone was talking about a cooking challenge on their blog. One where you have to use an ingredient you’ve never used before. This person chose saffron. Light bulb! I LOVE saffron! Because it’s so expensive, I think it’s under-used. However, a little really DOES go a long way!! Just look at that golden goodness floating around in the milk. I love how saffron instantly turns anything it touches into gold. It was steeped with the milk to infuse that luscious flavor all throughout the dough. Don’t waste any of those threads of goodness. Maybe I’ll have to bake up some more beignets. I was completely surprise with how easy the dough was to make, how soft and pliable it was, and how utterly tasty they are! HOLY WOW! They have just the right amount of sweetness in this light and airy dough. It’s almost like a brioche the way they come out. Fluffy in the middle, nice and crisp on the outside. Just fabulous! I don’t impress myself all that often, but I have done just that with these tasty beignets. A light dusting of powdered sugar and that’s all they need. No dipping sauce, no glaze, no drizzle. They’re perfectly tasty just like they are. #SundaySupper has put together a Fat Sunday menu! There are some rather tasty eats on that menu. Make sure you scroll down and see what everyone else has put together for the Fat Sunday #SundaySupper. Scald milk with the saffron. Allow to cool to between 100 to 105. Add the yeast and 1 tablespoon sugar in the bowl of a stand mixer. Add cooled milk and allow to sit 5 minutes or until bubbly. Add the egg and stir with a whisk until combined. Combine the 1/2 cup whole wheat pastry flour, 1 1/2 cups unbleached all-purpose flour, remaining sugar, and salt in a mixing bowl. Cut in the butter with a pastry blender or two knives until the mixture resembles coarse meal. Add the flour mixture to the yeast mixture. Using the dough hook, stir on medium-low speed until the dough starts to come together. Beat at medium speed, add additional flour as needed, until a soft dough forms into a ball. Knead an additional 5 to 6 minutes. Turn dough out onto a lightly flour surface and knead a few times. Let rest 15 minutes. Roll the dough out to 1/4 inch thickness and cut into eight 3 x 4 inch rectangles. Place on a baking sheet covered with parchment or a silpat baking mat. Cover with a towel and allow to rise 45 minutes. Preheat oven to 400 and bake 10 to 12 minutes, or until the tops are golden brown. Sprinkle with powder sugar and serve. I too have never had beignets. I also have never used saffron. I'm going to have to try out both by using your recipe. I like sweet things so I'm sure I will like them. Thanks for sharing at Saturday Dishes. So…I'll have 5 of these right now! 🙂 I've pinned and shared it!! I've been to New Orleans a few times and yet to have been to Cafe du Monde. Doesn't matter anyway because I'm certain these beignets would be a winner anyway. Love saffron. Love beignets, these look absolutely delicious. No King Cake. No muffalatas. Oh, you need a hug! That's ok, though. I've never had a savory beignet, but have always wanted to try that. I like that you've baked your beignets–frying is such a mess! Great color too. Thank you for linking your Mardi Gras creation, Christie! So beautiful – and they look like fluffy perfection! You know what is funny I love saffron and we bought some when we went to Turkey but I don't use it. It is such a precious spice that I don't end up using it. I really need to start using it up because as with all spices they do get stale after a while. 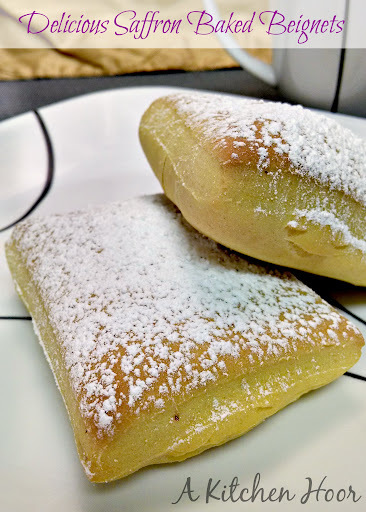 Loving all the baked beignet recipes today, can't wait to try! Wow! I love the addition of saffron! This sounds delicious and so decadent! Yum! Mardi gras food and traditions are fun and I have a lot of good memories with them. You did great on your maiden voyage, they look fantastic! It looks like your research paid off. These look amazing. I've never been to New Orleans, but I have had beignets once and loved them. These look awesome with the saffron addition! So cool that you baked them too! What an amazing recipe, love the saffron!! Gorgeous! I just love the color that the saffron lends the dough. I will take a dozen, please. I love that you baked the beignets! Now I don't feel guilty have a few! Love your recipe! Wow, the saffron gives such a gorgeous color to your beignets! And I'm certain they taste as fantastic as they look! These sure look gorgeous! Wish I could have one as I'm reading through all the wonderful Mardi Gras recipes! Thanks for sharing.